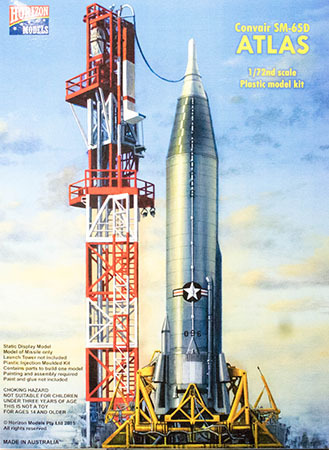 The Atlas family began as the first intercontinental ballistic missile (ICBM) system for the United States which was developed in parallel with the world's first ICBM, the Soviet R-7. The SM-65D was the first operational version of the Atlas which first flew in late 1958 and would service as part of the nation's nuclear deterrance until replaced by later versions. With its intercontinental range and payload capability, the SM-65D was also the natural choice to put the Mercury spacecraft into orbit. The launch vehicles modified for such duty were designated as LV-3B. Even after the SM-65D was retired from active duty, many of these vehicles were refurbished and served to put a variety of payloads into low earth orbit. The decal sheet has a full set of airframe stencils, all printed nicely by Microscale. For a nice addition to your launch vehicle collection, this kit provides a nice addition to the series and you might want to do all three payloads. The build-up Atlas looks really nice. For a look at the Mercury/Atlas built-up, look here.